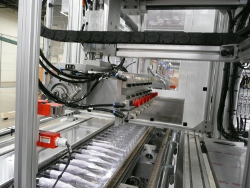 It is critical when linking custom assembly and feeding lines with integrated packaging systems to ensure a steady reliable flow of product from the production line to the packaging equipment. 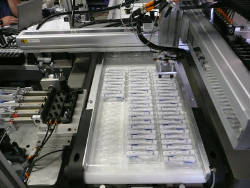 At Franklin Automation we have experience with synching continuous running equipment together with indexing type equipment, orientating product for packaging, inspecting product for packaging and sorting product for packaging. Our engineers work together with manufacturers of the production line and integrated packaging systems to ensure that all systems communicate together providing efficient system start-up and recovery procedures as well as alternate product flow scenarios if any machine is down for maintenance. There are many reasons Packaging Companies have relied on Franklin Automation for more than 25 years; but none is more important than experience. You make the right choice coming to Franklin with your challenge, because there’s a good chance we’ve tackled something similar before, and solved it.